Today The Spa Life reviews not one but two products from Rain, both in their Biologie Range – Rain Biologie Baobab & Rooibos Body Butter and Rain Biologie Rooibos Hydrating Hand Lotion, both of which we were lucky enough to receive recently. If you have never set foot inside a Rain store, you need to remedy that! With bright clean whites and a sensory overload of glorious smells, it is the perfect place to forget your troubles and stroll around in a new world of neutral colours and delicious products – some even look and smell good enough to eat! I’ve always associated Rain with Cape Town, so I was pleased to discover that they have expanded their reach throughout South Africa and even have stores in New York! Another great option is their online shop. Rain are also great for your conscience – they have a strict ethical sourcing policy, no child labour, no animal testing, no parabens… and the list goes on. They wear their Beauty Without Cruelty and SA Vegan Society badges with pride. Have a read of Rain’s Promise to make your inner hippie rejoice! Simple, neat and chic, the containers reflect the ethos of Rain and its African roots. The body butter comes in a 220ml (7.43 fl.oz) black plastic tub with a sticker label and the hand lotion is available in 60ml (2.2 fl.oz) tube of similar design. Admittedly not the most glamorous packaging out there, but it is straight-forward and still elegant in its own way. I wish I could put into words what this product smells like, but I have no idea. It doesn’t smell like rooibos tea and I have not got a clue what a baobab tree smells like, so I’m just going to have to go with this as a “unique” kind of earthy fragrance. The other aspect that I should raise is that I was unsure as to whether I liked the smell or not when I first tried the product, but it has definitely grown on me and now I love it for all its uniqueness! The body butter is thick and moisturizing but is easily absorbed into skin. It is great for dry Winter skin, but I think it will be light-weight enough to use in Summer too (will have to confirm this come Summer). This little tube houses a great hand cream that is not too thick that it absorbs quickly. The hand lotion is (as it says) very hydrating but once again I’m stumped on describing the fragrance! It differs from the body butter (presumably because there is no baobab in this one) but it has a refreshing smell that is slightly less earthy than the body butter. Originally I preferred the fragrance of the hand lotion to that of the body butter, but as mentioned above, I have now fallen for the body butter’s unique fragrance and it is now preferred! Rain Biologie Baobab & Rooibos Body Butter retails at around R155 (you can buy it here) and Rain Biologie Rooibos Hydrating Hand Lotion is an absolute steal at only R59 (get it here). Rain products make great gifts and although they may look expensive, they are in fact really affordable! Great products at an even better price from a company that is founded on and practices ethical principles! 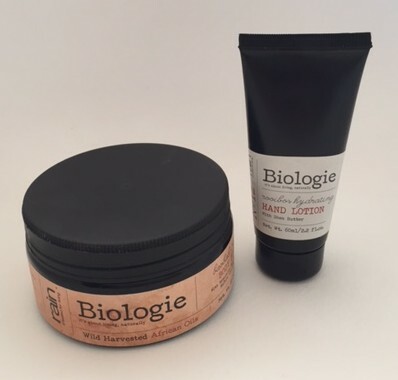 There are quite a few other products in the Biologie range (and even more ranges at Rain) to try so we will definitely be paying more attention to this brand! Rain, rain come again! Posted in Spa Product Reviews and tagged Body, Hands and Feet, Rain, Rain Africa.